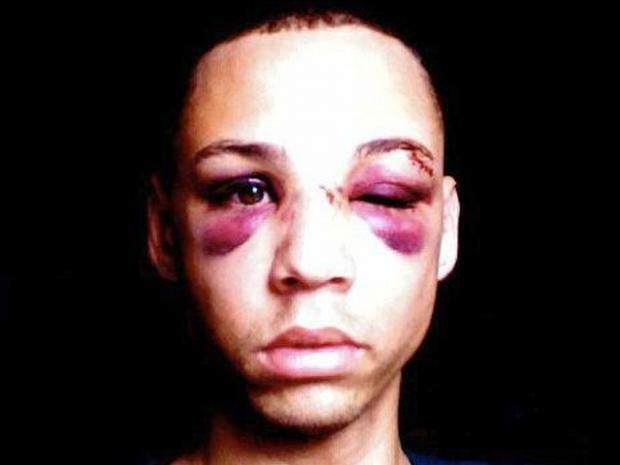 MANHATTAN — An aspiring model and dancer was brutally beaten in a possible anti-gay attack outside a West Village McDonalds, police said. Damian Furtch, 26, who had been working at the Pink Tea Cup on Bleecker Street earlier in the night, was leaving the McDonalds on 3rd Street and Sixth Avenue about 4:30 a.m. Sunday morning when he was attacked by two men, according to the NYPD and Furtch's boss, Pink Tea Cup owner Lawrence Page. Page said that Furtch was with another restaurant employee who managed to escape the attackers. Furtch was not so lucky — suffering two severely swollen black eyes and requiring four stitches, according to pictures and a description posted on his Facebook page. 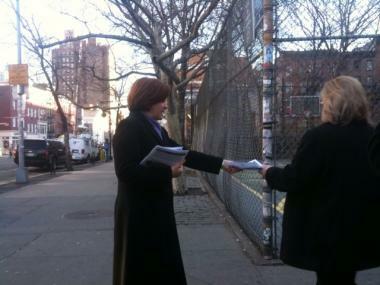 City Council Speaker Christine Quinn handed out flyers about Sunday morning's alleged anti-gay attack. "I THOUGHT I WAS SAFE IN THE CITY I LOVED BUT APPARENTLY WEARING FLORESCENT COLORED CLOTHING AND PINK SHOES LACES REALLY BOTHER SOME F-----G A--HOLES TO BLIND SIDE ME AND HIT ME," Furtch wrote on the social networking site. "4 STICHES THANKS B-----S."
Page said he believed the pink items, part of Furtch's work uniform, were what sparked the savage beating. City Council Speaker Christine Quinn, who was handing out police flyers near the site of the attack Wednesday morning, said that the attackers were also heard calling Furtch a "f-----g f----t" during the assault, suggesting that it had been motivated by bias. The matter was being investigated by the Hate Crimes Task Force, according to the NYPD. "It's unacceptable that this is happening in our city," Quinn said of the attack. She added that she was particularly upset to "have an incident like this happen in a neighborhood with such a large LGBT population, where the gay rights movement was born." While Page noted that Furtch would not be back to work "for a while," he said he would continue to pay his salary while he was out. The restaurant also worried about how Furtch's injuries would affect his career as a dancer and model. "I believe he just booked a gig – he was excited about it. So there goes that," Page said. The flyers being handed out Wednesday morning said the victim was attacked by two men between the ages of 18 and 20 years old. Police had not made any arrests in the attack as of Wednesday afternoon. West Village resident Janet Carey, 62, was surprised to hear about the attack in a community with such a large gay population, but she noted that the neighborhood changes at night. 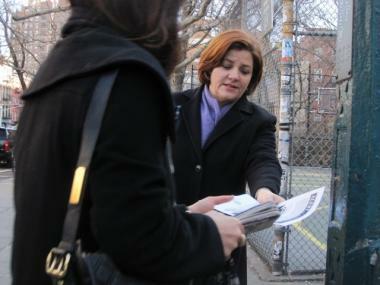 City Council Speaker Christine Quinn hands out flyers looking for information about an alleged anti-gay attack at a McDonald's on the corner of 3rd Street and Sixth Avenue. At "4:30 a.m., 5 a.m. — that's a dangerous time around here," the Thompson Street resident said. "That's the only time I'm afraid." Another long-time Villager, David Protell, 78, who was eating breakfast at the Sixth Avenue McDonalds Wednesday morning, said he worried that the location might be a target for people who are looking to get in fights with gay people. "On a Friday night this place is three quarters filled with gay kids," the 50-year MacDougal Street resident commented. Quinn said that the victim had an uneasy feeling about his attackers when he first spotted them inside the McDonalds. "It was one of those situations where the victim felt that he was being looked at," the city council speaker explained.